Sobaos Pasiegos - Cakes from Cantabria. (c) Lisa Sierra 2012 Licensed to About.com Inc.
Say sobaos to someone from the region of Cantabria, Spain and their mouth will begin to water. These traditional cakes from Valles Pasiegos are rich and fluffy, with lemon flavor and a hint of rum or anise. Sobaos pasiegos are made with flour, 3 eggs, sugar, peel of a lemon, a shot of rum, and a half pound of butter. Traditionally, sobaos are baked in small paper "molds," which are simply peeled away by the consumer, and are generally about 2 1/2 by 4 1/2 inches. It is not necessary to use sobao molds. If you do not wish to make your own paper molds, substitute muffin pans lined with paper cupcake liners, as we did. See the bottom of this recipe for links to web sites with instructions on making the molds. Heat oven to 350F (180C) degrees. Grate the lemon peel into a small bowl and set aside. In a medium mixing bowl, mix together flour, salt and dry yeast. Beat together the sugar and butter using an electric mixer, until thoroughly blended. Beat the eggs in a separate bowl and add eggs and rum to sugar-butter mixture and beat. With the electric mixer on medium speed, gradually add the flour mixture to the other ingredients. Be sure there are no lumps in the batter. It should have the consistency of a very thick, sticky batter rather than a dough. Use a ladle or large spoon to fill cups or molds with batter. If using traditional paper sobao molds: Be sure to place the molds on a cookie sheet before filling with the batter. Fill each mold only half full because the batter will double in height. 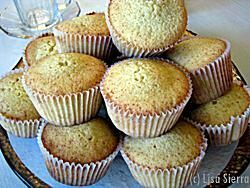 If using muffin pans: Place paper liners in the muffin pan before filling. Fill only half full because batter will double in height. Place on center rack of pre-heated oven and bake for 15-20 minutes. Allow to cool on a rack, then serve for breakfast or merienda. If you'd like to make your own paper molds for the sobaos, there is no shortage of cooking blogs and web sites from Spain, which describe step-by-step how to cut and fold the parchment paper. The molds are not difficult to make, however require patience because it is necessary to make about 18 of them for this recipe. Follow the links below to view the step-by-step instructions (in Spanish), as well photos. Even if you do not understand Spanish, the photos and markings should be sufficient for you to make the molds. Molde para sobaos pasiegos from hogarutil.com. This web site is particularly interesting because it has a printable template in PDF format and a series of photos with instructions. Molde para sobao pasiego from Universo de Sabores Blog. Como Hacer Moldes Para Sobaos from A Comer y a Callar Blog.